I am an account manager in my organization dealing with quarterly revenue goals, and my Outlook is always flooded with emails. Email is an integral component of my daily activity. We do have collaboration tools in the organization — Slack and Skype for business used to keep the teams informed. Customer conversations continue to be in emails. Email is a default gateway into an enterprise and also a point of the record. When I try to analyze my email inbox, only about 25% of the emails are actually from customers. The rest of them are emails working with my team, vendors, or partners to address the client needs. These emails could be about pricing negotiations, requests for new information, contract negotiations, getting the operations team involved, or getting a subject matter expert to resolve a pending issue. I usually forward an email internally or BCC my team to get them involved, often resulting in independent threads of emails contributing to the other 75% of my emails in the Inbox. The real challenge is trying to sift through the internal email threads to extract the responses and then transferring it the customer email threads; this is a very time-consuming process. While working with geographically distributed organization, responses from team members often span across 48 hours, making it even harder to track and respond efficiently to client requests. Until now, there has been no single platform that lets me stay within my outlook and continue to discuss with my team members or vendors in a contextual manner without losing focus. 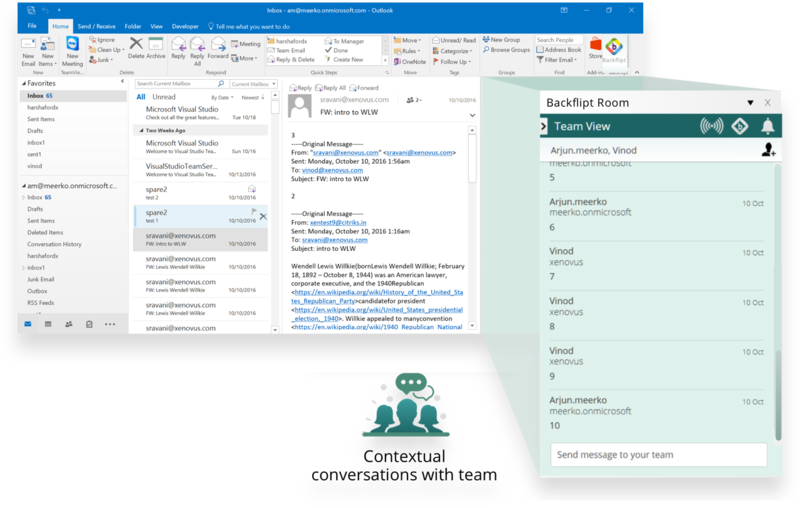 The Backflipt Teamview Outlook-plugin provides a contextual workspace that is connected and placed next to the customer email thread in Outlook. Teamview conversations are not sent to customers; these are private conversations that are only accessible to invited team members. Team members who are not using Backflipt will get emails, and their responses are pulled back into the Teamview and organized in a chronological manner. I can now read all team comments in Teamview in a chronological order placed right next to my customer conversation, thus providing me with context This helps me respond to client needs in a productive and informed way. I can draw the attention of specific members in Teamview using alerts. Another cool feature is that I can add new team members to this conversation at any time to keep them informed of the ongoing deals. I often end up using this feature to keep the legal teams abreast of a contract negotiation, executives on deal progress, or keeping the customer satisfaction teams informed.